I have heard on occasions the summation of the statement, “I know Mary Magdalene and she has a very powerful message for me.” There is a conviction in the person’s voice that comes from a passionate relationship with Mary Magdalene. For some of these people have had Mary Magdalene come to them in a channeled message or something has occurred where Mary Magdalene has touched them in an intimate way. Words sometimes cannot adequately explain what transpired but the person knows in their heart and soul Mary Magdalene has changed their life. Somewhere in their knowing they feel they know Mary’s message. In a way it feels more personal, like a person to person connection instead of goddess to person. 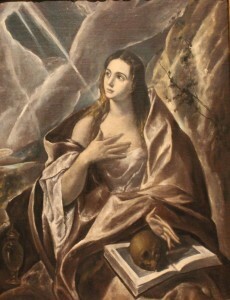 Mary Magdalene does have a different message than other goddess figures throughout history. She is not the same presence as Mother Mary, Quan Yin or Isis. It seems she has a highly evolved experience and ascension someone like the Virgin Mary but has a more human bound path than the mother goddesses. Mother Mary or Isis or more associated to be a part of the earth itself, in their ascension they become more of a guardian figure from and through the planet. Mother Mary has returned amongst the living as an apparition, her presence is felt by not only a special few people but others who go to where the apparition occurred. Mary Magdalene is a different kind of presence, she didn’t leave her human incarnation process to become an earth Guardian like Jesus or Mother Mary but remained in the human cycles to return in different forms while being a goddess figure. It is believed by some she has reincarnated throughout history to be an extraordinary person such as Joan of Arc or St Germana. Mary Magdalene took a different route, she was given a different role, a representative of the “Everywoman” who ascended but decided to be here amongst us. She took the quieter and more reserved path. She gives many the message that a common person can evolve to enlightenment and still be human, as she is amongst us. In the Languedoc region of southern France Mary Magdalene’s presence and memories still reign, it is remembered in the churches and revered by local residents, in addition it is in the land itself. As we investigate these sites we may also find that there is something much deeper than Mary Magdalene’s presence here as many of these places have lay lines connecting to the churches or power sports. We may feel Mary’s presence there and it is important to recognize that there were other sources energizing these locations as well. It may be one of the reasons why Mary Magdalene came here because it was a sacred place much like her previous residences in Israel and Egypt. In my personal exploration I have found Mary Magdalene’s presence here and energies that go deeper than an individual, ancient lay lines connecting deep within the earth and the local Stargate mountain Pic De Bugarach. Also it is important to acknowledge the people who have adored Mary Magdalene from the Templars, the Cathars and traditional French Catholics, their prayers and practices still resonate in these places. The history of a dedicated worship can be felt here. In comparison, I feel a great difference between the churches of my home in the United States and this area. These French places are alive with something more profound, a magic that enlivens us in a higher vibration. There are a variety of variables why the French churches and sacred sites are so special from the presence of Mary Magdalene, possibly Jesus living in France, apparitions of Mother Mary in the region, the various ancient energetic formations and the centuries of the dedicated seekers of spiritual growth all making this region a very transformative area. It is all here in the path of Mary Magdalene, Mother Mary and Jesus.